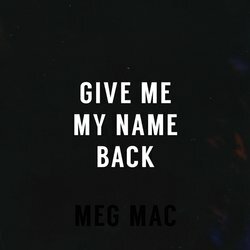 Meg Mac’s latest single ‘Give me my name back’ is a rallying cry, imploring girls to stand up, speak up and assert themselves. To feel individually empowered and collectively embolden; locked in solidarity with each other and every person whose lives have been destroyed as a consequence of mental or physical abuse. This song is about reclaiming identity, dignity and self-worth. "Most of my songs carry a similar message; Standing up and saying no I find hard to do – it’s still something I struggle with. I get so many messages from girls in response to my songs, who know exactly what I’m talking about and feel the same way – this is a song for everyone who has lost an important part of themselves, which they need to reclaim in order to move forward with their lives”, says Meg Mac. In 2013 MEG MAC signed to independent label littleBIGMAN records and released her platinum plus selling EP in 2014, including ‘Roll up your sleeves which has had over 10 million plays on Spotify. Her debut album ‘Low Blows’ produced by Niles City Sound (Leon Bridges ‘Coming Home’) in Fort Worth, Texas debuted at #2 on the ARIA Album Chart.